Natural events such as hurricanes, floods and earthquakes can occur anywhere in the world. In lesser developed countries, such as Cuba, local responses by government and non-government agencies and the availability of services following such a catastrophic event may not be the same as those you might expect in a developed country. Whilst the great majority of all interactions you may have with local people in Cuba is positive, there is still a small risk that some people may prey on the vulnerability of travellers. Laws and their application may vary considerably in our countries of operation and may be quite different from those of your home country. Ignorance of a law is not usually accepted as a valid defence if you breach local laws. Locally Sourced Tours takes all reasonable steps to minimise the risk faced by our travellers, guides and tour leaders. Please read on to see just a few of the things we do to reduce risk and some of the things you can do to manage these risks yourself. Our Responsible Travel policy endorses the UN’s Global Code of Ethics for Tourism. These guidelines are for the information of travellers with Locally Sourced Tours Ltd.. If there is any statement in these guidelines which conflicts, or is inconsistent, with Locally Sourced Tours Ltd. Booking Conditions those terms and conditions take precedence. Locally Sourced Tours is an New Zealand owned company and predominantly follows advisories issued by the New Zealand Department of Foreign Affairs and Australian Department of Foreign Affairs (DFAT). We also regularly monitor advisories from the UK Foreign and Commonwealth Office and US State Department. In addition to this we rely heavily on our staff employed in the region and their network of contacts for information. We have close contacts in Cuba who have a constant ‘finger on the pulse’ on developments within the region. We will not operate tours in a region where the New Zealand Department of Foreign Affairs has their highest level warning in place ‘Do Not Travel’. We may also implement special amendment or cancellation policies when the warning level reaches ‘Reconsider Your Need to Travel’. In a situation where such advice is current for a region we are scheduled to use we will restructure touring to avoid that region, amend or delay tours, or cancel tours altogether based on the actual situation. Visiting Cuba is generally safe; however petty street crime can occur. We recommend you wear as little jewellery as possible and keep your spending money close to your body in a secure place when out on the street. We further recommend that you take taxis, where available, rather than walk at night. We recommend you leave valuables in hotel safety deposit boxes at all times (or locked at least locked in your room) and carry photocopies of your passport, credit card numbers, and airline tickets, and keep a record of your uncashed traveller’s cheques. These papers should be kept in a safe place separate from the originals. As is also the case in your home country, it is unwise to walk deserted, dark streets at night in Cuba. Travellers should stick to well lit, busy areas at night to lessen any risk. 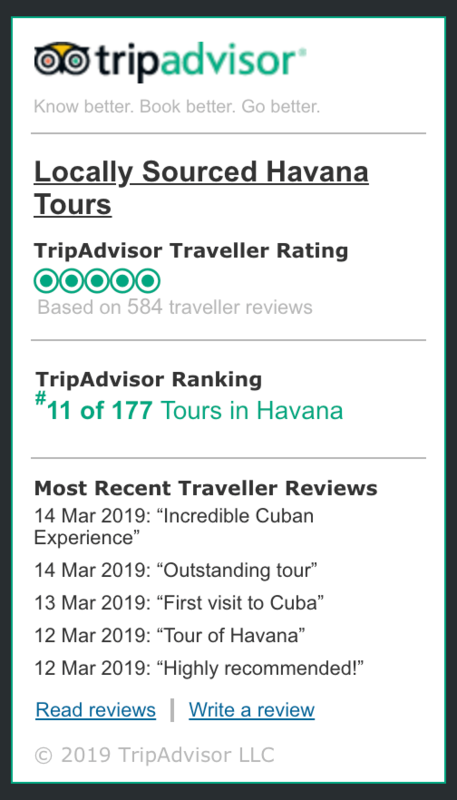 It is a condition of travel with Locally Sourced Tours that all travellers are adequately covered by comprehensive travel insurance prior to arrival in Cuba. Insurance should cover personal accident and medical expenses, evacuation and repatriation, baggage loss, and cancellation or curtailment of holiday. Insurance details must be supplied to us at the beginning of the tour, and where they are not provided or where the risk covered does not extend to those stated in the preceding sentence, we reserve the right to cancel bookings and apply charges as per our cancellation policy. Travellers will be asked to present their insurance details upon arrival in Cuba as part of a registration process, and in the event that possession of insurance is unable to be confirmed or the risk covered is inadequate, in the interests of our duty of care to the traveller and fellow travellers, Locally Sourced Tours reserves the right to prevent participation in the journey. In such instances, we will assist with onward travel arrangements, however full cancellation penalties will apply as per our cancellation policy. Note that travel insurance ‘attached’ to credit cards is often limited in scope (e.g. not covering serious medical, repatriation or evacuation expenses or other risks mentioned earlier) and in any case is usually effective only if travel arrangements have been purchased with the card. TRAVEL INSURANCE ASSOCIATED TO A US ISSUED CREDIT CARD OR BOUGHT FROM A US OWNED COMPANY WILL NOT BE RECOGNISED IN CUBA. Please note also that government regulations in Cuba might not require or enforce the possession of liability or professional indemnity insurance by hotels, transport and other suppliers. Even when insurance is in place, it can be for very limited coverage only. Travellers to Locally Sourced Tours destinations should take the same precautions as they would elsewhere in developing countries. In remote areas medical facilities can be particularly basic. We strongly recommend you take adequate preventative measures to minimise your risk of exposure to these health risks. We are a tour company and we are not qualified to provide detailed medical information appropriate to your individual needs. We recommend you consult with your local doctor or a specialist travel medical centre for current health information on vaccinations and medicines for your trip at least one month prior to departure. Taxis are usually metered and inexpensive and we recommend their use for personal transport in cities where available. It is generally safer to ask your hotel or Casa to call a taxi rather than hailing one on the street. To assist in finding your way back to your hotel, make sure you obtain a hotel address card to show drivers where you want to go. On the road we generally try to us use air-conditioned public buses, private vans or cars for our small group tours – depending on the size of the group. Sedan cars and minibuses are used for transporting smaller numbers. Seat belts are not always present, particularly in the back seats of vehicles in Cuba. Vehicles in more remote areas and lesser developed regions of Cuba may not be of the same standard as those in the bigger cities or more developed countries. Where seat belts are present we strongly recommend you use them. In some cases Locally Sourced Tours tour packages include domestic flights. Local airlines in Cuba operate relatively modern, well-maintained fleets, however schedules frequently change or flights can be cancelled and this can sometimes result in alterations to your programme. Locally Sourced Tours has no control over these situations, but we are conscious of these scenarios when we build our itinerary’s. Swimming at the many beaches and bays in Cuba is usually safe. Please note that beaches in Cuba are not patrolled by surf lifesavers as they are in many developed countries. Travellers should make their own decisions about the safety of swimming and the current surf conditions and swim at their own risk. There are many opportunities to participate in experiences outside of your scheduled touring. Locally Sourced Tours does not take responsibility for any activity that a client participates in that involves scuba diving, is not part of our itinerary or not booked through Locally Sourced Tours. Even if you have followed our guidelines, accidents do occur. Please note that in the often hot and humid conditions of Cuba even minor abrasions can quickly become infected and almost certainly some level of medical aid will be required – another reason to have comprehensive travel insurance and to pack a basic medical kit. In some cases, Scuba Diving excursions are included in Locally Sourced tours. Equipped and staffed dive centres in Cuba are located throughout the country. Bilingual dive instructors are certified by international agencies including the American Canadian Underwater Certification (ACUC), the Confederation Mondiale dÁctivites Subaquatiques (CMAS), Scuba Schools International (SSI) and more. PADI (US-based) does not operate in Cuba, but PADI certification is accepted in Cuba. While dive centres do have equipment to rent, as in all developing countries there are occasions that the gear might be relatively old and worn (but in most cases, still in perfectly good working order). Locally Sourced recommend that if you are traveling to Cuba to dive frequently, you should bring your own equipment where possible (dive computer, mask, fins, BCD and regulator). If you are uncomfortable using any of the dive gear provided at any location, you should opt out of the dive and review other options. Bring your dive certification as it will be required by all dive centres. Your first dive of the day should be the deepest. Eliminate or reduce alcoholic drinks. Drink as much water as possible before diving. Decrease the number of dives two days before flying. Do not fly (international flights) until 24 hours after your last dive. Always have travel insurance that includes diving in the policy. LOCALLY SOURCED TOURS LTD. ACTS ONLY AS AN AGENT FOR THE OWNER AND OPERATORS OF VARIOUS ACCOMMODATIONS, FACILITIES, SERVICES AND CARRIES AND ASSUMES NO RESPONSIBILITY OR LIABILITY FOR SERVICE, TRANSPORTATION OR EQUIPMENT MADE AVAILABLE BY ANY RESORT, HOTEL OR OTHER PERSON OR ENTITY, EITHER AS TO ITS AVAILABILITY OR AS TO ITS SAFETY, QUALITY OR CONDITION. Enjoy your holiday with Locally Sourced Tours. Please travel safely!